Two Giant Anteaters now call Connecticut’s Beardsley Zoo’s Pampas Plains home. Both the female, named Pana, and the male, named EO, were born in 2009. 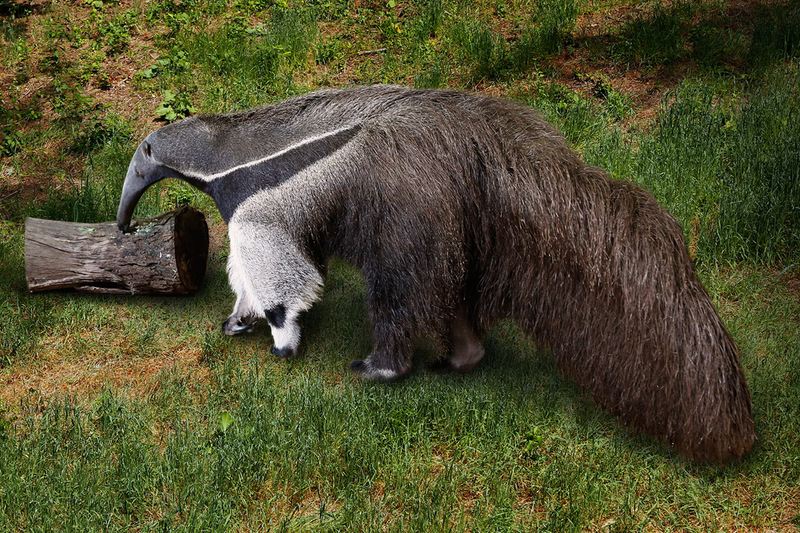 If you are not familiar with the Giant Anteater you may be confused at first glance as to which end is front and which is the back. Keep in mind they have bushy tails and long noses. They are quite good swimmers and use their long nose as a snorkel. DESCRIPTION: Giant Anteaters are the largest of the anteater species. They can weigh up to 100 pounds and be up to seven feet long. They have a long narrow head and snout, small eyes and round ears. At the end of the snout or jaw is a small, black, moist nose similar to a dog’s nose. Their fur is coarse and may be gray or brown. They also have a white-banded black stripe that runs along the body. They have bushy tails which can be two or three feet long with the fur hanging down up to 16 inches. Giant Anteaters have one of the lowest body temperatures in the animal kingdom at 91 to 97 degrees Fahrenheit. They are considered edentate animals because they have no teeth. The Latin name for anteater is Vermillingua which means, “worm tongue”. A Giant Anteater’s tongue can be as long as two feet! They use their long, sticky tongues that can flicker up to 160 times per minute to grasp ants, termites and other insects. Giant Anteaters use their sharp front claws to make an opening in an anthill or termite mound so they can stick their long snout and tongue in to feed on the residents. However, they do not destroy the structure. They know it will be repaired and repopulated for later meals. Giant Anteaters have poor sight but they have excellent smell, which is how they find their food. They walk in a slow sort of shuffle but they actually curl their claws under their feet so they are kind of walking on their “fists”. Giant Anteaters are quiet. They do not vocalize much except when they are threatened. When they are still pups they can make a shrill, high-pitched grunt to let the mother know they are in distress. Although the Giant Anteater is a mild-manner creature when threatened it can rise up on its hind legs and slash an attacker with powerful and sharp front claws. RANGE: In the wild they are found from southern Belize to Northern Argentina. HABITAT: They inhabit grasslands, humid forests and woodland areas. FAMILY LIFE: Giant Anteaters are usually solitary animals. A female will give birth to one pup per year. The pup is born fully furred, weighing about three pounds, and is identical to the adult in appearance. The offspring stays with the mother, sometimes riding on her back for up to a year. Offspring are weaned within a few months of birth but may stay with the mother for up to two years or until the mother becomes pregnant again. LIFE SPAN: They live on average 14 years in the wild and up to 26 years in human care.